Vintage books are simple. Slow. Cloaked in rich language and contain illustrations that draw the mind to thoughts of virtue and goodness. 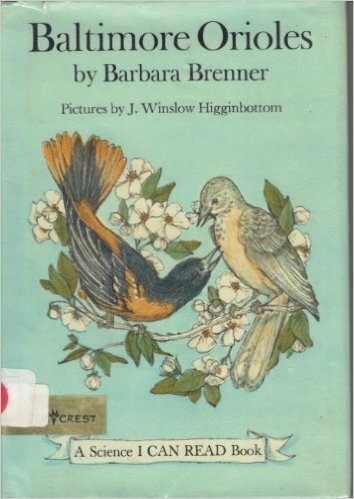 Vintage books celebrate the everydayness of everyday life. They glorify the simple things and help to foster a thankfulness of the things that are actually right in front of me. This month, you'll see a little vintage on our list of lovelies. We are enjoying the rich and slow. We are savoring. 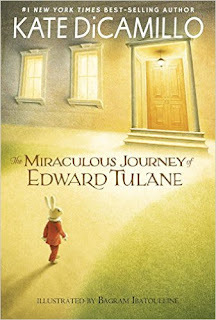 The Miraculous Journey of Edward Tulane- This book has been lauded by all my trusted book people. 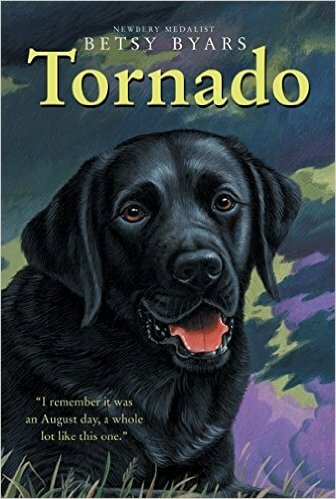 It's been on my GoodReads list for quite some time. I have finally pulled it off the shelf and have cracked it open. We are about a third of the way through and I can already see a finish line of redemption and forgiveness ahead. I'm expecting great things! Loving My Actual Life- A few years ago, I hunkered down with Jen Hatmaker's 7: An Experimental Mutiny Against Excess. Although I didn't agree with some of Hatmaker's conclusions, I really enjoyed the book. So far, Loving My Actual Life is very 7-esque. 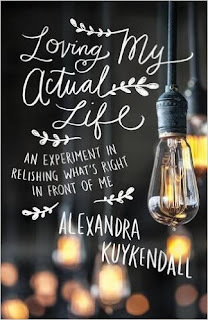 The author journaled her way through a nine-month quest to find contentment in the everyday ordinariness of life and then set all her findings down in a book. 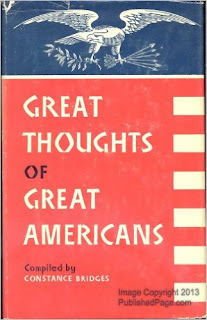 Great Thoughts of Great Americans- This is definitely not a sit-down-and-read-in-one-sitting kind of book. 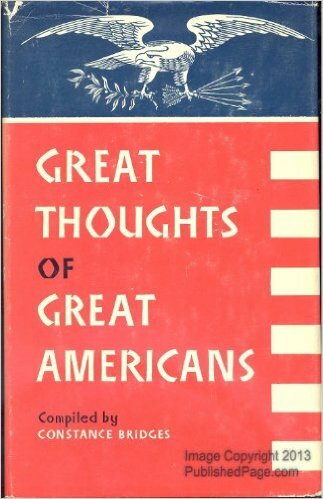 It is a compilation of excerpts from famous sayings, writings, and orations of great Americans throughout history. I don't have the time to read all of these historical works in their entirety. But, I find much value in studying the greatness of great men and women. Reading a page or two of this book each day has been an effortless way to read all the highlights and expose myself to some of the wonderful wisdom of our founders without reading multiple volumes. 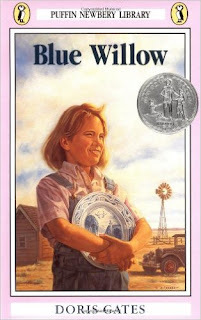 Blue Willow- She's almost done with this one that she started last month. She's had a very busy month and hasn't had time to steal away to read as much as she'd like. 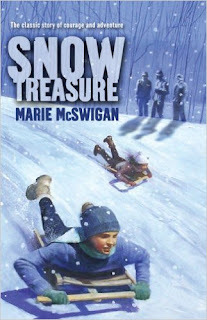 Snow Treasure- (Mom-assigned book) He's just getting into the last and best parts of this one. Nazi soldiers. Hidden treasures. Courageous kids. And sledding. What's not to love about this suspenseful novel set in war torn Norway? The Story of the Second World War for Children- (Just-for-fun book) Are you sensing a theme with the books my oldest son chooses each month? He is a walking WWII encyclopedia. Books like this one add to his ever-growing appreciation for the greatest generation. 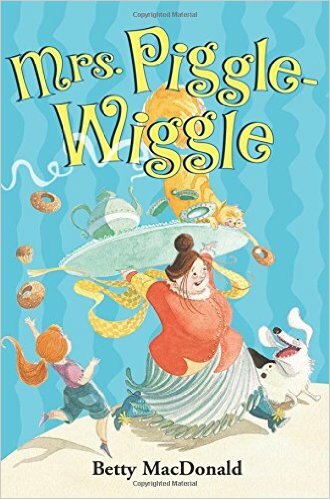 Mrs. Piggle-Wiggle- (Mom-assigned book) As I watched him fall in love with the whimsy of Pippi Longstocking last month when we read it aloud as a family, I knew that my son just had to be introduced to Mrs. Piggle-Wiggle. 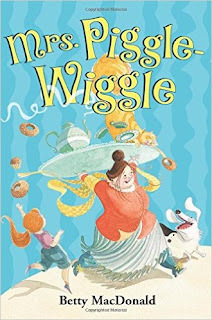 He loves delightfully silly fictions and this MacDonald classic is as silly as they come. 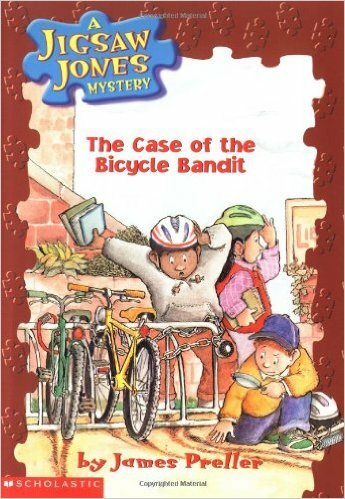 The Case of the Bicycle Bandits- (Just-for-fun book) To be honest, I've lost count of the number of times my son has read this book. He continues to reread Jigsaw Jones favorites again and again. But as Oscar Wilde once said, "If one cannot enjoy reading a book over and over again, there is no use in reading it at all." Tornado- (Mom-assigned book) Over the years, I have culled a short list of simple chapter books for young readers that I continue to introduce to each one of my kids in turn. This one is always near the top of the pile. 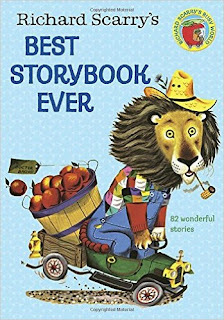 Richard Scarry's Best Storybook Ever- This is treasury of the best of Richard Scarry. It's a vintage bit o' perfection that I am reading aloud from each day. And what's got you hooked this month? Whatcha reading? 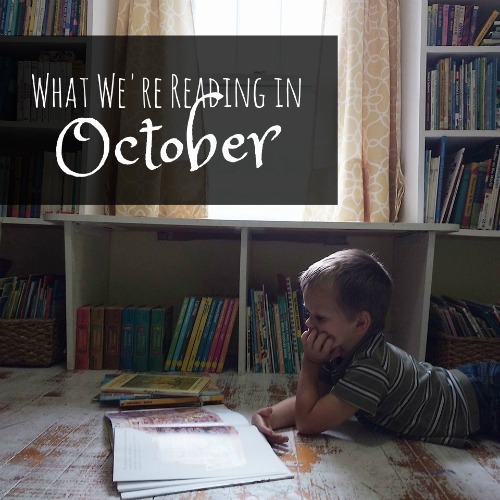 *sigh* I wish there was a "What We're Reading" post every day of the week! So helpful. 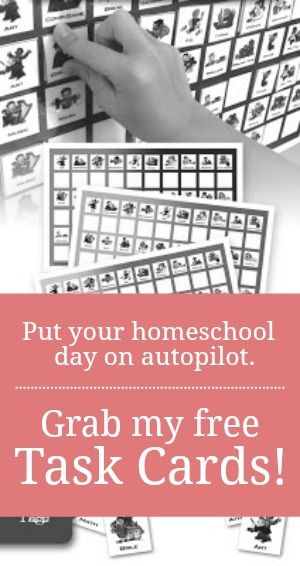 I wish I COULD write one every day of the week. They're my favorite posts to write. I could talk about books all.the.live.long.day, Ivy. I've actually been toying with the idea of creating a separate site just for book reviews and recommendations. Well, I would certainly read that! It is so lovely. 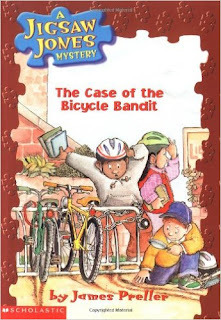 But then again, I usually love anything by Richard Scarry. 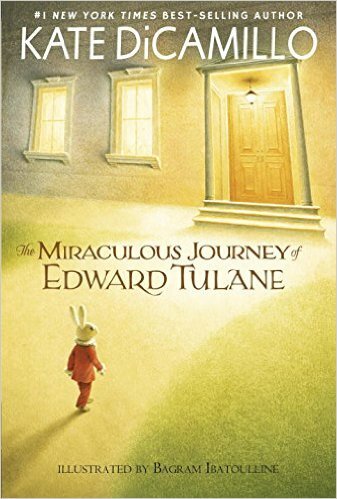 I really enjoyed Edward Tulane's story. 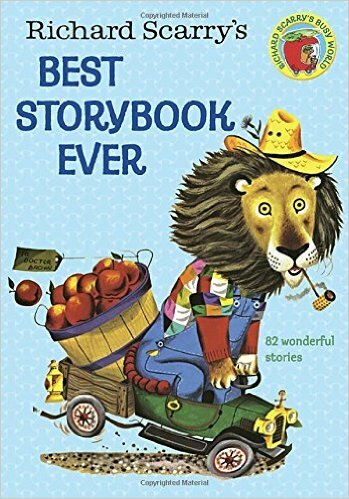 I read it to both of my girls, when they were younger. I am reading The Insanity of God by Nik Ripken and finally nearing the end of Watership Down, which I'm reading aloud to the kids. How are you liking Watership Down? I'm not a fantasy fan, but it was one of my husband's favorite books growing up. How do you constantly come up with so many of these!?! I'm a little addicted to books, I suppose. Love these posts always. Thanks. Just finished reading Loving My Actual Life and it was a fantastic read. It read so easily, I could hardly put it down. It was the perfect choice for the busy November. Thanks for sharing! 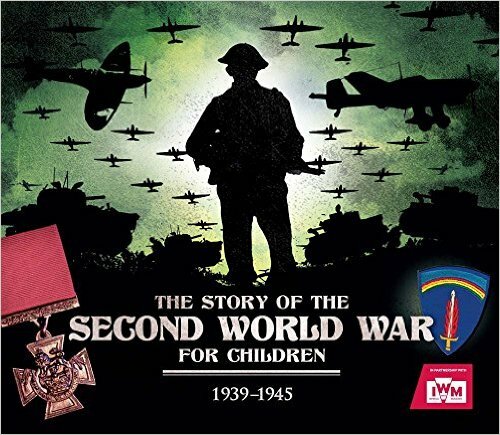 My nine year old wants to read about World War 2. 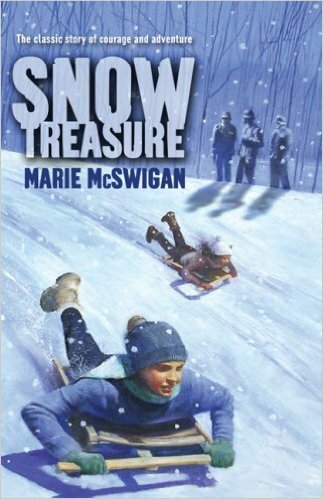 I requested Snow Treasure and The Story of the Second World War from the library to preview to see if the content is too much for him. Any others you would recommend? Thank you! Number the Stars and Twenty and Ten--both good ones. I've also heard good things about The Winged Watchman. You're welcome. I'm not sure why my answer appeared as "guest," but I'm glad you were able to see them.